River Navigational Chart is an essential tool used for solving any navigational issues, such as examination, analyzing and selection of the data on navigational and hydrographic situation on rivers. The site shows images of the official navigational charts. All the cartographical images are scoping ones not suitable for use for navigational purposes. The SHSU does not bear responsibility if they are used for unintended purposes. More information: Discover Ukraine by boat, a nautical guide for Ukraine inland waterways (Blogspot page). Reference charts with medium to hight resolution, PNG files. Маяки : ФДУ "Миколаївський район Держгідрографії" - ФДУ "Одеський район Держгідрографії" - ФДУ "Керченський район Держгідрографії"- ФДУ "Севастопольська філія Держгідрографії ім. Л.І. Мітіна". Атлас є першим в Україні спеціалізованим виданням такого роду, що за багатьма параметрами не має аналогів у світі. Його унікальність визначається тематичним охопленням, детальним висвітленням океанографічних, кліматичних та інших параметрів Азово-Чорноморського басейну, а також повнотою баз даних, використаних у процесі побудови карт Атласу. В Атласі представлено карти за багатьма характеристиками морського довкілля, у тому числі такими, які раніше не входили до подібних видань. Прибережне Попередження (ПРИП) - повідомлення, що доводять до мореплавців інформацію про зміни навігаційних умов та режиму плавання на Чорному та Азовському морях ДУ «Держгідрографія». Дані, викладені у ПРИП, містять навігаційні та метеорологічні попередження, повідомлення щодо безпеки в районах відкритого моря і іншу термінову інформацію. ПРИПи передаються за допомогою системи НАВТЕКС (MSI). The ADMIRALTY Digital Catalogue (ADC) provides a comprehensive and up-to-date reference of ADMIRALTY Maritime Products & Services, including Standard Navigational Charts and Publications, as well as AVCS, ARCS and ADMIRALTY ECDIS Services. Users can search for these products by type, scale or a defined route, with weekly updates available online to keep you fully up-to-date. NP109 is the North West Europe catalogue which contains a full list of ADMIRALTY Leisure Chart Folios, Standard Nautical Charts and details of other Leisure products for this area (2019). Theses files features some of the ADMIRALTY products and services currently available. The service provides tidal data for over 7000 ports worldwide together with a host of other useful information - make Admiralty EasyTide your first port of call for reliable tidal information. Free predictions for today and the next 6 days (HTML). PDF charts whith low resolution, zoom to 300%. ​​​​​​​​​​​​ADMIRALTY Maritime Security Chart contain safety-critical information to assist bridge crews in the planning of passages through high risk areas. Information includes details on piracy, exclusion zones and embargoes. Maritime Security Charts should be kept up-to-date with the latest security-critical navigational information. The Security Related Information to Mariners (SRIM) service provides all of the data you need to maintain the Q Series charts as well as additional security related information which will aid passage planning. The glossary contains concise definitions of many of the important astronomical terms necessary to understand and make use of the data presented in The Astronomical Almanac. Its contents remain the same from year to year, but occasionally terms are added or dropped. The information is available as HTML or as PDF. These PDF copies of sight reduction forms are available: From The Nautical Almanac (NP 314) there is NA Concise Sight Reduction Form. From Rapid Sight Reduction Tables for Navigation (NP303/AP3270) there are Rapid Sight Reduction Form, Volume 1 and Rapid Sight Reduction Form, Volume 2 & 3. Category Zone of Confidence (CATZOC) values are assigned to geographical areas to indicate whether data meets a minimum set of criteria for position, depth accuracy and seafloor coverage. The Zone of Confidence (ZOC) value is dependent on the positional and depth accuracy of the survey. Our Zones of Confidence (ZOC) table outlines the position accuracy, depth accuracy and seafloor coverage for each of these values to help you manage the levels of risk during navigation. More information about ZOC. This simple guide has been provided to help you identify genuine ADMIRALTY products and reduce the risk of counterfeits being used for navigation. ​​​​​​​Produced by maritime experts at the United​ Kingdom Hydrographic Office​, the ADMIRALTY Guide to Audits and Inspections​ identifies key issues which may be examined during any third-party inspection or audit of on-board ECDIS. This includes a checklist based on the IMO ECDIS carriage requirement and Performance Standards, as well as explanatory notes that can help shipping companies to prepare for and pass ECDIS audits. Information and guidance on the safe and effective use of UKHO's digital nautical publications: ADMIRALTY Digital Publications (ADP) and ADMIRALTY e-Nautical Publications (e-NPs). The Knowledge Base of the Customer Service Portal contains a lot of useful information on commonly reported or already answered queries: installation, error, update..
and a Cumulative Summary of Amendments to ADMIRALTY Sailing Directions and Miscellaneous Nautical Publications with NP247(2). NP247(2) contains the text of all updates to current editions of ADMIRALTY Sailing Directions and Miscellaneous Nautical Publications which have been published in Sections IV and VII of ADMIRALTY of Notices to Mariners and which remain in force on 31 December. Here you will find all relevant ADMIRALTY Notices to Mariners (NMs) released since the publication date of the chart within the leisure range's New Edition. This service is updated weekly and aims to provide you with the best information available to help you navigate safely and effectively. This publication records the date of issue of the current edition of each navigational chart and of subsequent relevant Notices to Mariners issued. The list is published annually, with Part A (2019) in January and Part B (2018) in July. There is also a weekly file on the Notices to Mariners with the name NP234WKww-yy where ww is the week number and yy is a two digit representation of the year. The UKHO's searchable NMs database, known as NM Websearch, allows users to to search by Chart number for NM text, full colour NM Blocks and Notes. Options: Search for Updates by Chart Number - Search for Updates by Chart Number from a specified NM Number/Year only - Search for Updates by Chart Number from a specified date only - Search for Individual Notices to Mariners by NM Number and Year - View Update list by Chart Number. If you are unable to take advantage of the automatic updating option within the ADMIRALTY Digital Publications application, you can obtain the updates you need from here. In order to use this site you need to have a fully licensed version of the Admiralty Digital List of Lights (ADLL) product and/or ADMIRALTY Digital Radio Signals (ADRS). The update files obtained here will contain all the information you need to bring your ADLL / ADRS product fully up to date. ADMIRALTY Notices to Mariners Guidance Notes. MSI leaflet: Information about Maritime Safety Information (MSI) broadcast times and areas. Her Majesty's Coastguard is responsible in the UK for the broadcast of marine weather forecasts and Maritime Safety Information (MSI) on NAVTEX, VHF and MF and for providing the Radio Medical Advice Link Call (MEDILINK) Service. With amendments apply to the MSI Leaflet. This Notice and the Rules referred to in it are an integral part of the Merchant Shipping (Distress Signals and Prevention of Collisions) Regulations 1996, which came into force on 1 May 1996. These Regulations implement the Convention on the International Regulations for Preventing Collisions at Sea, 1972, as amended. They enhance safe navigation, by prescribing the conduct of vessels underway, specify the display of internationally-understood lights and sound signals and set out collision avoidance actions in close quarter situations. Also Corrigendum and Amendment. Guidance on the use of Very High Frequency radio (VHF) and the appropriate use of the Automatic Identification System (AIS). Given the continuing number of casualties where the misuse of very high frequency marine radio has been established as a contributory factor, it has been decided to re-issue the MCA guidance on the use of Very High Frequency radio (VHF). Additionally, appropriate use of the Automatic Identification System (AIS), especially with regard to collision avoidance, has been highlighted in conformance with the IMO guidelines. The guidance aims to assist UK ship owners, companies, ship operators, masters and crews in understanding the risk of piracy, armed robbery and other acts of violence against ships, and reminds them of the importance of taking action to deter such acts and advises on how to deal with them should they occur. This guide explains how maritime security is managed in the UK, how to comply with EU regulation on ship security, how security measures are applied and how you should comply with them. It also provides guidance on how to deal with stowaways and deter acts of violence against merchant ships, such as piracy and armed robbery. This guidance note provides an overview of the Merchant Shipping legislation that applies to pleasure vessels, including rules relating to certification and manning requirements. The relevant regulations cited in this note apply to UK pleasure vessels wherever they may be and for some of the regulations to non-UK pleasure vessels in UK waters. This guide mainly deals with issues specific to UK registered large commercial yachts, such as operations and manning standards, and what to do about them. The guide covers the following: manning qualifications, hours of work crew agreements, official log books and their completion, GMDSS logs, health and safety, medical stores and care, surveys, audits and ILO Inspections,continuous synopsis records, UK publications to be carried, training (More information about large yachts). Guidance for fishermen on and health and safety best practice, and applying merchant shipping and fishing vessel regulations. This guide outlines safe working practices and emergency procedures for fishermen. It provides a broad range of advice in respect of fishing vessel safety and should be used by everyone: owners, skippers and crew. This guide should be used as a reference guide but can also prepare yourself on what to do in an emergency. Use this guide to help prepare for a survey. It explains what the surveyor will be looking at during the ‘out of water’ and ‘on board’ survey. Find out what things you can check before the survey so that you can identify and solve problems beforehand. The ‘on board’ survey covers 8 areas for you to check in detail. These are: wheelhouse, wheelhouse top/casing top/shelter top, accommodation, main deck, fish room, engine room, equipment tests, vessel operations and drills. Information for owners, operators, skippers and crew about safety standards in the fishing industry. This collection offers guidance to support and encourage safe working practice at sea and meeting legal/technical requirements for fishing vessel safety. Topics covered are: Fishing vessel standards and surveys - Fishing crew safety guides and leaflets - Technical advice - Codes of practice. Exposure to high levels of electro-magnetic fields (EMFs) can give rise to effects that may be irritating or unpleasant, or sometimes harmful and cause burns. This guidance contains information to help employers to: Identify sources of electromagnetic fields (EMF) in workplaces on ships - Assess the exposure of workers to EMF in the workplace - Decide what, if anything they may need to do to protect workers from the riskarising from exposure to EMF- Assess and control any risks from EMFs - Apply for an exemption from certain aspects of the Regulations. See also the Electromagnetic Fields Regulations (2016, No.1026). Practical medical guidance for laymen (non-doctors) working on board a ship. This manual is written for laymen (non-doctors) working on board a ship. It contains a wide range of authoritative advice and will help you: assess and treat injuries, diagnose and treat illness, on journeys where you won’t have quick access to professional medical advice. This is a list of the Acts and Statutory Instruments relevant to the operation of vessels in UK waters that the Maritime and Coastguard Agency are responsible for. See also the Merchant Shipping Regulations and the Fishing Vessels Regulations. Merchant Shipping Notices (MSNs) contain the technical information that is associated with the Regulations (Statutory Instruments) laid down by Parliament. The letter suffix after the M-notice number tells you if it relates to merchant ships and/or fishing vessels: (M) for merchant ship - (F) for fishing vessels - (M+F) for both merchant ships and fishing vessels. These factsheets clearly describe and illustrate the processes involved in global weather and climate, providing the most up-to-date answers and information. The aim of this book is to present the elementary theory of meteorology in a way that is suitable for Merchant Navy Officers and to explain its practical application to safe and economic ship operations (1993). The Marine Observer's Handbook is written for three purposes: (1) To assist officers aboard United Kingdom vessels, who voluntarily make observations at sea on behalf of Meteorological Services, to carry out this work in an efficient and uniform manner. (2) To encourage all mariners to take an interest in recording observations of (a) meteorology, (b) marine phenomena and wild life, (c) optical phenomena, and (d) basic oceanography, and to assist them in their study of these important and interesting subjects. (3) To provide a book of reference for candidates for Certificates of Competency issued by MSA, the Marine Safety Agency of the Department of Transport (1995). Tide times are available for around 500 locations in United Kingdom and are displayed beneath the weather forecast for up to five days ahead. In the UK we mostly experience a semi-diurnal tide which means we experience two high tides and two low tides each day. These occur approximately every 12 hours and 25 minutes. Latest marine observations for offshore for offshore (buoys & light vessels) ansd the coast (land systems & stations). This website has been derived in part from material obtained from the UK Hydrographic. The RCCPF publishes nautical books and downloads about ocean sailing, coastal ports and anchorages worldwide. With each book description there is free additional information. The RCCPF publishes nautical books and downloads about ocean sailing, coastal ports and anchorages worldwide. The Foundation publishes pilotage information through books and a range of media accessible via its own website. You need to sign up so that you can access and download our range of free publications. Areas: Crete - South Orkney Islands - South Atlantic Islands- South Georgia - South Shetland Islands - Antarctic Peninsula - South West Africa - Southern California Channel Islands - Fiji Lau Group - Aleutian Islands and Alaska to Vancouver Island including British Columbia - French Guiana, Suriname and Guyana. This page lists all the currently available updates and supplements for the RCCPF's publications. These are also downloadable from the individual publication pages of the website. 1. Users of GPS receivers are advised of potential problems due to gps week counter roll over on 06 apr 19. 2. The GPS system transmits time to gps receivers using a format of time and weeks after the start date of 06 jan 80. The data field in the navigational message sent by GPS satellites containing the number of weeks after the start date is limited to a maximum of 1023 weeks. When the GPS system reaches week 1024, the system will revert back to week zero. 3. Some GPS receivers are known to be unable to make the transition from week 1023 to 1024. If the GPS receiver is outdated or lacks proper updates, the receiver will revert to reading the week zero as august 1999. during this time the internal clocks of these gps receivers will experience a lack of absolute reference and may give the wrong time and position ormay lock up permanently. 4. Some of these GPS receivers are repairable with upgrades and others will become unusable. Users are advised to check with their GPS manufacturer regarding the status of their receiver. 5. For further information see: GPS Week Roll Over Issue or also GPS.gov 6. failure to verify your gps receiver could lead to serious navigational problems placing lives and property at risk (Based on Navarea IV warning 187/19). The American Practical Navigator (NGA Pub. 9), first published in 1802, was billed as the "epitome of navigation" by its original author, Nathaniel Bowditch. The text has evolved with the advances in navigation practices since that first issue and continues to serve as a valuable reference for marine navigation in the modern day. The publication describes in detail the principles and factors of navigation, including piloting, electronic navigation, celestial navigation, mathematics, safety, oceanography and meterology. It also contains various tables used in typical navigational calculations and solutions, including the formulas used to derive the tabular data. The International Code of Signals (NGA Pub. 102) publication contains descriptions and graphic depictions of a specific vocabulary of signals and the various methods used to transmit them. Worldwide coverage, 7 volumes. The List of Lights, Radio Aids and Fog Signals is published in seven volumes, as Publication numbers 110 through 116. Each volume contains lights and other aids to navigation that are maintained by or under the authority of foreign governments. With radiobeacons and differential GPS stations. The West Coasts of Europe and Africa, the Mediterranean Sea, Black Sea and Azovskoye More (Sea of Azov), West and South Coasts of France. British Isles, English Channel and North Sea, North Coasts of France. The Radar Navigation and Maneuvering Board Manual (NGA Pub. 1310) contains, in a single volume, information on the fundamentals of shipboard radar, radar operation, collision avoidance, navigation by radar, and a description of vessel traffic systems in US waters. Worldwide coverage, edition 2014. The Radio Navigational Aids (NGA Pub. 117) publication contains a detailed list of selected worldwide radio stations that provide services to the navigator. The publication is divided into chapters according to the nature of the service provided. Services include RDF and Radar stations; stations broadcasting Navigational Warnings, time signals or medical advice; communication traffic for distress, emergency and safety, including GMDSS; and long range navigational aids. Worldwide coverage, 42 volumes. Sailing Directions (Enroute) include detailed coastal and port approach information, supplementing the largest scale chart of the area. Each publication is subdivided into geographic regions, called sectors, which contain information about the coastal weather, currents, ice, dangers, features and ports, as well as a graphic key to the charts available for the area. Worldwide coverage, 5 volumes. Sailing Directions (Planning Guides) include relevant physical, political, industrial, navigational and regulatory information about the countries adjacent to a particular ocean basin in a single volume. The Sight Reduction Tables for Air Navigation (HO249) are published in three separate Volumes. Volume I of Pub 249 used by both the marine and air navigator, contains altitude (to the nearest minutes) and true azimuth values of seven selected stars for the complete ranges of latitude and hour angle of Aries. These seven stars represent the best selection for observation at any given position and time, and provide the data for presetting instruments before observation and for sight reduction afterwards. Volumes II and III cover latitudes 0°-40° and 39°-89° respectively and are primarily used by the air navigator in conjunction with observations of celestial bodies to calculate the geographic position of the observer. The Sight Reduction Tables for Marine Navigation (HO229) is published in six Volumes, each of which contains two eight-degree zones of latitude with a one-degree overlap between Volumes. They are designed to facilitate the practice of celestial navigation at sea. The tables are primarily used with the Intercept method of sight reduction by entering arguments of latitude, declination, and Local Hour Angle and obtaining tabulated altitudes and azimuth angles. The tables are prepared and published by NGA on an as needed basis. Compass Error from Amplitudes Observed on the Visible Horizon - Altitude Correction for Air Temperature - Table of Offsets - Latitude and Longitude Factors - Altitude Correction for Atmospheric Pressure - Altitude Factors & Change of Altitude - Pub 229 - Compass Error from Amplitudes Observed on the Celestial Horizon - Meridian Angle and Altitude of a Body on the Prime Vertical Circle. The Nautical Calculators can be used to solve many of the equations and conversions typically associated with marine navigation: Celestial Navigation - Conversions - Distance - Log and Trig - Sailings - Time Zones - Weather Data. United States coasts. The USCG Light List is published in seven volumes and contains lights and other aids to navigation used for general navigation that are maintained by or under the authority of the U.S. Coast Guard and located in the waters surrounding the United States and its Territories. The World Port Index (NGA Pub. 150) contains the location and physical characteristics of, and the facilities and services offered by major ports and terminals world-wide (approximately 3700 entries), in a tabular format. Entries are organized geographically, in accordance with the diagrams located in the front of the publication. U.S. Chart No. 1, Nautical Chart Symbols, Abbreviations and Terms, presents the symbols depicted on paper nautical charts produced by the NGA and the NOAA, and on raster representations of these charts such as Raster Nautical Charts. The NGA charts are NOT corrected for Notice to Mariners; however, a link to the latest corrections is given for each chart. Use these charts as a ready reference or planning tool. Navigate with the official printed or digital charts (Nauticalchartsonline). For the Arctic regions 27 NGA charts: Norwegian Sea and Adjacent Seas, Greenland to Kara Sea, North Star Bugt Anchorage (Greenland - West Coast) Denmark, Poluostrov Kamchatka to Aleutian Islands including Komandorskiye Ostrova, Kara Sea to Bering Straight, Hudson Straight and Bay... From the "Map Products" section of the NGA Arctic Support website. The Earth’s north magnetic pole is shifting so rapidly that steps are being taken to ensure it doesn't impact navigation. For example, over the past few decades the North magnetic pole has been drifting toward Siberia at an irregular speed: this migration can adversely affect the accuracy of navigation. This leads to more frequent updates of the World Magnetic Model, which describes the planet’s magnetic field and value of declination (GeoGarage blog). The Handbook of Magnetic Compass Adjustment (DMA Pub. 226) includes information about terrestrial magnetism, the theory behind magnetic compass adjustment, and detailed procedures for manual correction of magnetic compass error. The WMM is the standard model used by DoD, NATO, and IHO for a wide range of positional and navigation systems. Feedback from the WMM user community as well as the degree of the variation in the northern hemisphere drove the decision to make this out-of-cycle update. The 2019 full release of the out-of-cycle WMM (WMM2015v2) is now available. All WMM products and services have been updated. This new model addresses the degraded performance of WMM2015 in the Arctic region and supersedes it. The model seeks to mitigate any user performance degradation caused by a one-degree gridded variation (GV) in the polar region. An increased GV error may adversely affect compass navigation and other magnetic field-based systems in the arctic region. Available world maps: WMMv2 2019 Declination Map - WMMv2 2019 Total Intensity Map (More information about the Out-of-Cycle Release, NGA-NOAA). Magnetic declination is an important concept for accurate navigation. A compass will always point along the lines of magnetic force (which converge on what are called the magnetic poles). The angle between the direction of force and the direction of the geographic north pole is called the declination. As one moves across the surface of the globe, lines of constant magnetic declination are called isogonic lines. These charts below depicts, for 2019, isogonic contours of magnetic variation at 2° intervals (Main Field Declination). More information about The World Magnetic Model (NCEI). As the earth's magnetic field varies over time, the positions of the north and south magnetic poles gradually change. The magnetic declination at a given location also changes over time. These charts below depicts, for 2019, isogonic contours of annual change in magnetic variation at 2' intervals (Annual Change Declination). More information about The World Magnetic Model (NCEI). Worldwide coverage, 5 areas. Pilot Charts depict averages in prevailing winds and currents, air and sea temperatures, wave heights, ice limits, visibility, barometric pressure, and weather conditions at different times of the year. The information used to compile these averages was obtained from oceanographic and meteorologic observations over many decades during the late 18th and 19th centuries. Summary of Corrections publications, separated into five regional Volumes, contain a summary of Notice to Mariners corrections issued from the edition date of each chart or publication product up to the "Corrected through NTM" number of the Volume. Navigational Warnings are issued regularly and contain information about persons in distress, or objects and events that pose an immediate hazard to navigation. The four types of Navigational Warnings - NAVAREA IV, HYDROLANT, NAVAREA XII, and HYDROPAC - are categorized by their location. The Daily Memorandum is issued each week day, and contains a summary of all Broadcast Warnings and Special Warnings promulgated during the past 24-72 hours. Also a query form is available to retrieve Broadcast Warnings from the on-line database. The Navigational Warnings Prototype Web Map Application, can be used with a web browser to display in-force Broadcast Warning messages, Navigational Warning and SAR limits, and their Points of Contacts. The Office of Maritime Security (MAR-420) supports the U.S. maritime transportation system, the U.S. Merchant Marine, and other elements of the U.S. maritime industry. We provide information for U.S.-flag vessels. Table of Contents: Maritime Security Communications with Industry (MSCI) - Piracy and Armed Robbery Against Ships - Maritime Domain Awareness (MDA) - Maritime Administration Certification of Cruise Vessel Security and Safety Act (CVSSA) Training Providers - Port Security Grant Program - Maritime Cyber Security - Federal Maritime Security Agency Information - Regional Threat Information and POCs - Office of Maritime Security Contacts. MSCI implement a streamlined interagency approach to communicating with U.S. maritime industry stakeholders regarding identified maritime security threats. This approach establishes a single consolidated U.S. Maritime Advisory System for issuing U.S. Maritime Alerts and U.S. Maritime Advisories. The U.S. Maritime Alert has been developed to expeditiously provide basic information (location, incident type, and date/time) on reported maritime security threats to U.S. maritime industry interests. A U.S. Maritime Advisory may follow the issuance of a U.S. Maritime Alert and is intended to provide more detailed information, when appropriate. The U.S. Maritime Advisory System utilizes a “whole-of government” approach vice a single U.S. government agency approach. While U.S. Maritime Alerts and Advisories are transmitted by the National Geospatial-Intelligence Agency and are posted on the MARAD-hosted MSCI Web Portal, they should not be referred to as originating from a single agency. The US Notice to Mariners provides timely marine safety information for the correction of all US Government navigation charts and publications from a wide variety of sources, both foreign and domestic. To ensure the safety of life at sea, the information published in the Notice to Mariners is designed to provide for the correction of unclassified nautical charts, the unclassified NGA/DLIS Catalog of Hydrographic Products, United States Coast Pilots, NGA List of Lights, USCG Light Lists, and other related nautical publications produced by NGA, NOS and the USCG. On 6-7 April, a parameter in the GPS system will “roll over” to zero, which may affect older GPS equipment, or equipment that has not received firmware or software updates recently. The GPS satellite constellation transmits the exact time to all GPS receivers. The format for this information includes a parameter that represents the week, called the GPS week number. The week number has been counting incrementally by 1 since January 5th, 1980, and is an integral part of the navigation message received by all GPS receivers. When the week number reaches 1024 at 18 seconds before midnight (UTC) on April 6th, 2019, it will reset to zero as it keeps counting. This has happened once before in August of 1999. Older GPS receivers, or receivers that have not been provided manufacturer updates, may be impacted by the rollover. The impact might occur in April, or could affect such equipment at a later date. On these receivers the date might revert back to August 1999, or may revert to another date. Since this issue does not affect the other parts of the GPS navigation message, (it only affects the date), the receiver’s ability to calculate the position and to display the exact time of day should not be impacted. To best prepare for this rollover event, users of GPS equipment who are concerned should update their firmware, or contact their equipment manufacturer to ensure their equipment is ready for this event. Find additional information about GPS and the GPS Week Number Rollover here: GPS.gov. Civil GPS users are encouraged to report disruptions or anomalies to the U.S. Coast Guard Navigation Center or via phone at 703-313-5900, 24 hours a day (Based on LNM Special Notice 2019). The purpose of this Navigation and Vessel Inspection Circular (NVIC) is to provide U.S. Cosat Guard marine inspectors and the maritime industry with uniform guidance regarding what the Coast Guard now considers equivalent to the chart and publications carriage requirement in the Title 33 and Title 46 of the Code of Federal Regulations (C.F.R.). United States coasts. The USCG Light List is published in seven volumes and contains lights, sound signals, buoys, daybeacons, and other aids to navigation used for general navigation that are maintained by or under the authority of the U.S. Coast Guard and located in the waters surrounding the United States and its Territories. The purpose of a Vessel Traffic Service (VTS) is to provide active monitoring and navigational advice for vessels in particularly confined and busy waterways. There are two main types of VTS, surveilled and non-surveilled. VHF communications network forms the basis of most major services. The Coast Guard operates 12 Vessel Traffic Centers (VTC). VTS information (Chartlets, General Information, News and Events and User Guides) for these VTS areas: Berwick Baay, Houston Galveston, Louisville, Lower Mississippi River, New York, Port Arthur, Puget Sound, Saint Mary's River, San Francisco and Tampa. This booklet will give you, the recreational boater, the basic information you need about the U.S. Aids to Navigation System (USATONS). This information will help you recognize, understand, and navigate by the colors, shapes, numbers, and lights you will encounter on the water. It will also give you the basic tools you need to read a nautical chart (Boating Safety Division). This document CIM16672.2D is a merger of the Inland Navigation Rules and the International Regulations for Preventing Collisions at Sea (COLREGS 72). Contents: International and inland rules of the road and their respective technical annexes - Bridge-to-bridge radiotelephone regulations - Vessel traffic management regulations - Other pertinent provisions for waterway users. There is a PDF file with the edition of August 2014 corrected to November 30th 2015 and an HTML version with amalgamated current international and inland navigation rules. This PDF booklet, (and companion webpage) is an amalgamated copy of the “U.S. Inland Navigation Rules” and the “International Regulations for Preventing Collisions as Sea, 1972 (COLREGS, 72)”, including their annexes, and, some other associated U.S. regulations. Practice Your Visual NAVRULES! This is is a randomly selected visual NAVRULE problem from our flashcard database. In many cases, what is presented are words or phrases, and you should think of the definition or definitions that meet the condition(s) of the words or phrases. Then, click on the image to obtain the correct answer(s). This edition is not meant to be a detailed “how to” book for specific diseases. Current information on specific diagnostic and treatment protocols is better obtained from onshore medical consultation. Instead the purpose of this edition is to provide enough information so that someone, who has had the required classroom and other practical skills training, can examine a patient and appropriately communicate the medical findings to a shore-based practitioner (US DHHS/PHS, Pub. 03-2024, 2003). Commercial fishing has consistently remained one of the most dangerous occupations in the nation. Ensuring that vessels are in full compliance with safety requirements and crews are trained in safety and survival techniques, we can contribute to improving the safety record of the commercial fishing industry. The Commercial Fishing Vessel Safety Digest brings together all the federal regulations applicable to the operation of uninspected commercial fishing vessels in one location and in an easy to read and understand format. These include safety and survival equipment, navigation safety, pollution prevention, and emergency instruction and traning. The Digest of valuable to anyone associated with the U.S. commercial fishing industry including individual fishermen, fleet operators, instructors/trainers, equipment providers, USCG personnel, and others involved with the industry (USCG & AMSEA). The Radiotelephone Handbook is a user’s guide addressing proper radiotelephone procedures. It consolidates portions of International Telecommunication Union radio regulations and various allied communications publications into a single source reference for field use. In 1979, a group of experts drafted the International Convention on Maritime Search and Rescue, which called for the development of a global search and rescue plan. This group also passed a resolution calling for the development of a Global Maritime Distress and Safety System (GMDSS) to provide the communication support needed to implement the global search and rescue plan. The U.S. Coast Guard (USCG) will discontinue service from its remaining 38 Differential Global Positioning System (DGPS) over the next three years. This staged reduction of the remaining DGPS broadcast service sites will begin in 2018 and end with the curtailment of the Coast Guard broadcast of GPS corrections over medium frequency (MF) in 2020. The Navstar Global Positioning System (GPS) is a space-based radio-positioning and timetransfer system. GPS provides accurate position, velocity, and time (PVT) information to an unlimited number of suitably equipped ground, sea, air and space users. Passive PVT fixes are available world-wide in all-weathers in a world-wide common grid system (hostile imitation). GPS comprises three major system segments, Space, Control, and User (1996). This document defines the levels of performance the U.S. government makes available to users of the GPS Standard Positioning Service, also known as the civilian GPS service. With current (2007) Signal-in-Space (SIS) accuracy, well designed GPS receivers have been achieving horizontal accuracy of 3 meters or better and vertical accuracy of 5 meters or better 95% of the time. Interface Specification IS-GPS-200 defines the requirements related to the interface between the GPS space and user segments for radio frequency link 1 (L1) and link 2 (L2). 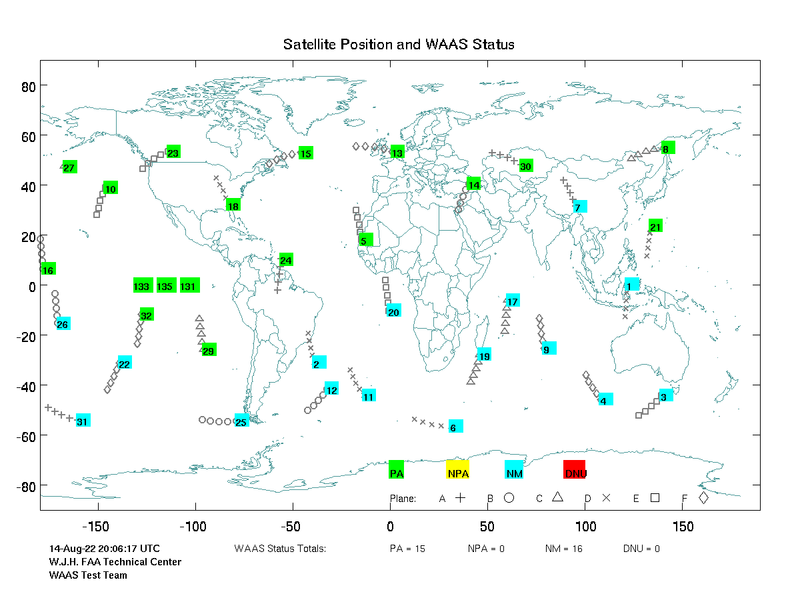 The Operational Advisory (also known as a GPS Status Message) provides a summary of the status of the satellite constellation. A GPS Notice Advisory to Navstar Users (NANU) is an advisory message to inform users of a change in the GPS constellation. These messages are released 72 hours in advance for planned maintenance. These messages are also used to notify users of unscheduled outages. General NANUs can be used to disseminate general GPS information. If you are experiencing GPS issues relating to land-based or maritime positioning, navigation, or timing signals, please submit a GPS disruption report using the form. NAVCEN cannot assist you with equipment issues. If your GPS unit or others' GPS units are leading people to an incorrect address OR are otherwise leading people to an incorrect location, the problem is not likely a "GPS" problem, but rather, it is very likely a MAPPING problem. Unfortunately, the Navigation Center cannot assist you with GPS unit mapping problems, as we do not develop, control, nor repair the mapping software contained in GPS units, including vehicle navigation systems. Civil GPS Users are encouraged to submit reports of GPS problems to NAVCEN. A form to submit reports can be found on our GPS Problem Reporting webpage. Some information from those reports is shared here along with input from interagency partners and the most likely cause of the report. Descriptions for each of the fields is at the bottom of the page. The LORAN-C User's Handbook, COMDTPUB P16562.6, provides an overview of LORAN-C, use of LORAN-C receivers, interference to LORAN-C and its effects, nautical charts and tables containing LORAN-C information, in addition to other applicable topics. The Automated Mutual Assistance Vessel Rescue System (Amver) is a worldwide voluntary ship reporting system operated by the United States Coast Guard (USCG) to promote safety of life and property at sea. Amver’s mission is to quickly provide SAR authorities, on demand, accurate information on the positions and characteristics of vessels near a reported distress. Any merchant vessel anywhere on the globe, on a voyage of greater than 24 hours duration, is welcome in the Amver system and family. International participation is voluntary regardless of the vessel’s flag of registry, the nationality of the owner or company, or ports of call (Manual in English, Chinese and Dutch). You may obtain navigation information or quick-links to navigation information on a single page (without having to navigate through several sections of our site for the same information) by selecting one or more of the options (GPS NANU, DGPS outages, Local notice to mariners or Light list corrections), and then clicking on "Continue". From there, you may select the region(s) in which you are interested. Then, clicking on "Show Selected Information" will display either navigation information or quick-links to the information for the region(s) you selected. The Coast Guard employs a three-tiered system of Maritime Security (MARSEC) Levels designed to easily communicate to the Coast Guard and our maritime industry partners pre-planned scalable responses for credible threats. The USCG Local Notice to Mariners is updated weekly and is available for download in Portable Document File (PDF) Format. NOAA recommends that mariners take advantage of the most recent chart updates by using the NOAA Electronic Navigational Chart (ENC) for navigation in U.S. waters. ENCs provide the most up to date information, whereas paper and raster nautical chart updates may be up to one month behind the corresponding ENC coverage. Over the next few years, mariners will see continued improvement in the extent and detail of ENC coverage, while there will be a reduction in RNC and paper chart coverage and service. ENCs will include routine changes between editions that are not published through notices to mariners. One significant change to the RNC and paper charts will be the removal of controlling (minimum) depth information from many maintained channels. Controlling channel depths will still be provided on ENCs. Compasses use predicted values of declination (the difference between true north and where your compass points) to help correct navigation systems for a wide variety of uses. As Earth's magnetic field evolves these predicted values can become off as the rate of change in Earth's magnetic field evolves due to unpredictable flows in Earth’s core. The north polar region is experiencing one of these erratic changes: Earth’s northern magnetic pole is moving quickly away from the Canadian Arctic toward Siberia. Due to these unplanned variations in the Arctic region, scientists have released a new World Magnetic Model (WMM) to more accurately represent the change of the magnetic field. This out-of-cycle update before next year’s official release of WMM2020 will ensure safe navigation for military applications, commercial airlines, search and rescue operations, and others operating around the North Pole. NOAA's Nautical Chart Catalog gives you the ability to view any of NOAA's 1000+ nautical charts, as well as download NOAA's general use charts in three different raster formats: NOAA RNC® full size nautical charts in PDF format, and BookletCharts™. These charts are updated weekly and include all of the latest Notice to Mariners corrections. Select a region to access the NOAA Nautical Chart Catalog. Charts obtained from NOAA's Nautical Chart Catalog are for general use only and do not comply with U.S. Coast Guard carriage requirements for commercial vessels. NOAA's suite of 1000+ coastal and Great Lakes nautical charts provide up-to-date navigational information to mariners. There is 9 PDF catalogs: 2 for the sailing and general charts (small-scale charts), 7 for the harbor charts, small-craft charts and coast charts (medium-scale charts and large-scale charts). Mariners should always obtain the largest-scale coverage for near shore navigation. NOAA Chart Locator shows the limits of NOAA charts on a map and when you click on the area chart it is possible to view or upload it. With the link "NC" there is also a listing that provides all corrections to this chart. The information are available for raster charts (paper charts, PDF charts, booklet charts, RNC) and ENC. The United States Coast Pilot consists of a series of nautical books that cover a variety of information important to navigators of coastal and intracoastal waters and the Great Lakes. Issued in nine volumes, they contain supplemental information that is difficult to portray on a nautical chart. Available in one PDF file (top of the page) and a PDF, HTML or XML file by chapter. Distances Between United States Ports contains distances from a port in the United States to other ports in the United States and from a port in the Great Lakes, United States, to Canadian ports in the Great Lakes. A Strategy to Transform Nautical Charting. This plan describes a strategy to make comprehensive improvements across the entire suite of NOAA nautical chart products. Part I describes the current set of NOAA nautical chart products and their distribution. Part II describes some of the steps we are taking to improve those products, including changes to chart formats, scales, data compilation, and symbology. At the end of Part II, some thoughts are presented about the long-term future of NOAA navigational products. Each NOAA nautical chart contains a vast amount of information unique to the geographic area that it covers. While each chart is unique, it is assembled using standard conventions that are understood by the mariner. Sections of the FAQ: General, Nautical Charts, ENC, RNC and Hydrographic Data & Products. Regulations and other documents related to nautical chart and publication carriage requirements for commercial vessels in U..S waters: Code of Federal Regulations - Federal Register Notices - USCG Circulars. U.S. Chart No. 1 describes the symbols, abbreviations, and terms used on nautical charts. It is produced by NOAA and the National Geospatial-Intelligence Agency. The symbols for paper charts and their analogous digital products, such as NOAA raster navigational charts (NOAA RNC®) are shown, as well as the symbols used to portray NOAA electronic navigational charts (NOAA ENC®) data on Electronic Chart Display and Information Systems (ECDIS). With the new edition of NOAA raster charts, channel legends and tabulations, where indicated, reflect the U.S. Army Corps of Engineers (USACE) project depths. The channel may be significantly shoaler, particularly at the edges. For detailed channel information and minimum depths as reported by USACE, use NOAA Electronic Navigational Charts. USACE surveys and channel condition reports are also available on the USACE Hydrographic Surveys (eHydro) application. The hydrographic surveys provided by this application are to be used for informational purposes only and should not be used as a navigational aid. Channel conditions can change rapidly and the surveys may or may not be accurate. NOAA publishes the official navigation charts to be used in US waters by mariners. Displays charts in web browser. View NOAA's 1000+ U.S. coastal and Great Lakes nautical charts that provide up-to-date navigational information to mariners. These charts are updated weekly and include all of the latest Notice to Mariners corrections. Also available from the Chart Catalog. Click on "Paper Charts (RNC & PDF)". On the map, select a chart and on the section "Available Products" click on "View" to view online the raster version. Displays charts in web browser. View NOAA's U.S. coastal and Great Lakes nautical charts that provide up-to-date navigational information to mariners. Charts for upload and print / Cartes marines téléchargables et imprimables (PDF). Don't use for regulated commercial vessels / Ne pas utilisez pour la marine marchande. Updated weekly / Mise à jour chaque chaque semaine. Full-size, 400dpi printable charts. NOAA’s newest addition to the nautical charting portfolio is the new Portable Document Format (PDF) nautical chart, which provides up-to-date navigation information in this universally available file type. The PDF nautical charts are available for a three-month trial period, from October 22, 2013, to January 22, 2014. Key features of the PDF nautical chart: Updated Weekly - Available Immediately - Enhanced Readability - Printable - Easy to view. For mariners using paper charts to meet chart carriage requirements under federal regulations, only printed charts provided by NOAA certified Print-on-Demand (POD) providers will meet U.S. requirements when the traditional lithographic nautical charts are no longer available. Also available from the Chart Catalog. Click on "Paper Charts (RNC & PDF)". On the map select a chart and on the section "Available Products" click on "PDF" to get the PDF version. Charts on booklet for upload and print / Cartes marines en livret téléchargables et imprimables (PDF). 8.5" x 11" printable panels of the charts for U.S. Coasts. The NOAA BookletChart is an experimental product that you can print at home for free. They are made to help recreational boaters locate themselves on the water. The Booklet Chart is reduced in scale and divided into pages for convenience, but otherwise contains all the information of the full-scale nautical chart. Also available from the Chart Catalog. Click on "Paper Charts (RNC & PDF)". On the map select a chart and on the section "Available Products" click on "BC" to get the BookletChart version. A prototype version of a powerful new online tool, NOAA Custom Chart, is now available for boaters and other nautical chart users. The application enables users to define the scale and paper size of custom-made nautical charts centered on a position of their choosing. The user may download, view, and print the output. Start guide: Click on the green icon on the top and select the scale chart and the paper size - Click on the second icon and click on the map to select a location - Wait - Click on the third icon and move the red rectangle on the selected area - Click on the green circle on the left and click on "Export Products" - Wait - Click on the PDF link with a name like "Dynamic Area, Chart_?, GeoPDF". All products generated by this prototype service are for demonstration purposes only and are not to be used for navigation. Graphical interface to upload RNC file chart by chart. NOAA Raster Navigational Charts (NOAA RNC®) are full-color digital images of NOAA's entire suite of paper charts. NOAA provides weekly updates to the RNCs, which are available for free on this site in the BSB format. NOAA RNC® files are official data that can be used in many types of electronic charting systems, including Raster Chart Display Systems (RCDS) and Electronic Chart Display and Information Systems (ECDIS). The Raster Navigational Charts are available in BSB format. Also available from the Chart Catalog. Click on "Paper Charts (RNC & PDF)". On the map select a chart and on the section "Available Products" click on "RNC" to get the RNC version. Non-graphical interface (listing) to upload one or multiple RNC at a time. Raster map with upload for web map tools / Cartes marines papiers scannées téléchargables pour site web. The NOAA RNC Tile Service is comprised of 15 million individual chart tile images. Each full RNC is cut into thousands of smaller “tiles” that display much faster than full RNC images. The tile service provides geo-referenced, nautical chart tile sets for the public that comply with several web map and map tile standards. NOAA RNC tiles can be used with GPS enabled electronic chart systems or other “chart plotter” display systems to provide real-time vessel positioning. Tiles are also being used on third party nautical data integration websites. NOAA RNC tile service data DOES NOT meet USCG chart carriage requirements for commercial vessels. Displays ENC charts in web browser. View NOAA's U.S. coastal and Great Lakes nautical charts that provide up-to-date navigational information to mariners. Graphical interface to upload ENC file chart by chart. Vector files of chart in S-57 format. NOAA Electronic Navigational Charts (NOAA ENC®) are vector data sets that represent NOAA's newest and most powerful electronic charting product. NOAA ENCs conform with the International Hydrographic Office (IHO) S-57 international exchange format, comply with the IHO ENC Product Specification, and are provided with incremental updates that supply Notice to Mariners corrections and other critical changes. NOAA ENCs and updates are available for free download. NOAA ENC data may be used to fuel Electronic Chart and Display Information Systems (ECDIS). Click on "Electronic Charts (ENC)". On the map select a chart and on the section "Available Products" click on "ENC" to get the ENC version. Non-graphical interface (listing) to upload one or multiple ENC at a time. A weekly update of the edition numbers and other information about current versions of NOAA nautical products: Find out if you have the latest edition of NOAA nautical products. The lists below include the edition number and date of the latest version of each product and additional information. The lists are updated weekly. From this site, you can access the same chart updates that NOAA uses to update their Print-on-Demand paper charts. Enter a chart number and the service display a listing that provides all corrections that apply to this chart. While information provided by this listing is intended to assist in the updating of nautical charts, it must not be used as a substitute for the United States Coast Guard, National Geospatial-Intelligence Agency or Canadian Coast Guard Notice to Mariner publications. With this service the weekly correction for NOAA charts are displayed on a map. How do you know when it is time to get a new chart? The idea is to give users the ability to visually identify where all changes (water depths, shoreline, obstructions or other features) are occurring on their charts each week. With that information, you can make your own determination about when you may want to purchase an updated paper chart or download an updated raster or electronic navigational chart. The update includes the position of each update (latitude and longitude), the action that needs to occur, along with a brief description of the item and any additional labeling that should be added to the chart (More information about the Weekly Chart Updates). This is a sample of the most frequent questions that I have been asked over the past 35+ years. I have gathered and consolidated information from numerous sources to address these questions thus creating a general reference guide for mariners. This reference guide was created primarily for distribution at boating, fishing and diving shows. No longer being updated. Only for Alaskan Waters. Marine Service Charts (MSC) list frequencies, schedules and locations of stations disseminating NWS products. They also contain additional weather information of interest to the mariner. The schedules contained in this publication were obtained from official and unofficial sources. The information herein may neither be complete or accurate. Wherever possible, the schedules are dated with the latest change available. The latest version of marine weather charts for broadcast by the U.S. Coast Guard are available from the National Weather Service Telecommunication Gateway on this server. Charts: wind, wave, ice, surface, upper air, cyclone danger area, sea surface temperatures, satellite imagery. Areas: North West Atlantic - North Pacific and Tropical East Pacific - Gulf of Mexico, Caribbean, Tropical Atlantic, and Tropical East Pacific - Alaska, Northeast Pacific and North Pacific - Central, Southeast and North Pacific. Wind gusts can be a further 40 percent stronger than the averages on the charts and maximum waves may be up to twice the significant height. Products listed on this page are provided by the Ocean Prediction Center, the National Weather Service Forecast Office in Anchorage and the National Hurricane Center. The forecast area includes the offshore and high seas waters. The products are transmitted via high frequency (HF) through transmitters of the United States Coast Guard. The HF shortwave signal is decoded by Weather FAX receivers onboard ships in the forecast area. The broadcast frequencies are listed at the at the bottom of the page. Ocean Prediction Center's Radiofacsimile Charts User's Guide. In consultation with its users, OPC has designed a timely product suite of graphics and high seas marine warnings and forecasts. When displayed together and organized the charts provide the mariner with a complete meteorological and oceanographic picture. Prudent decision making dictates the mariner use all available information from as many sources as possible. Also in PDF. These charts depict winds (knots) with winds barbs and significant wave heights (feet or meters). The combined sea heights are depicted in solid contours of three feet or one meter increments with relative maxima or minima combined sea state values enclosed inside a box under or adjacent to the area of interest. The ice edge is displayed as a bold jagged line (bright blue) during the winter months. On the offshore & adjacent waters analysis for the East coast of USA & Canada there is buoys and ships data: reported sea state from buoys and ships is in feet and is colored red (green for IR satellite maps), the period of predominant swell wave is in seconds and is colored purple (bright blue), the swell direction is shown by the black (white) arrows, and the reported wind speed and direction is shown by the blue (yellow) arrows. Significant wave height is defined as the average height of the highest 1/3 of wave heights observed (More information). The central value of significant wave heights imply that higher individual waves are possible. 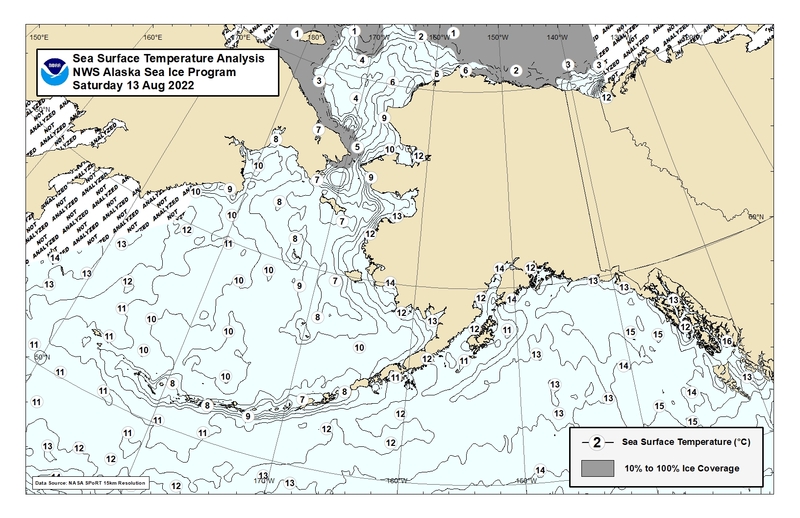 Ice Desk: The NWS Sea Ice Program produces daily sea ice analysis maps and sea surface temperature maps for marine areas located around Alaska including Cook Inlet. Sea ice forecasts focused on changes to the ice edge in the next 5 days and the Sea Ice Advisory text product are produced every Monday, Wednesday, and Friday. 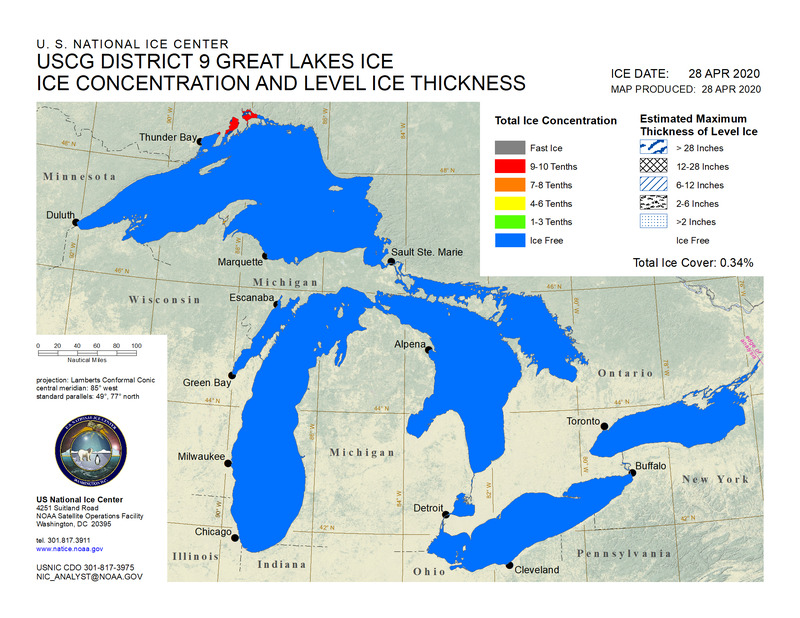 Ice Analysis: ice concentration charts & estimated ice thickness charts - Graphical Ice Forecasts - Text Ice Forecasts - Ice Climatology. This booklet is intended for use by volunteers to report aerial, shipboard, or shoreline observations of ice conditions at sea to authorities such as the National Weather Service, National Ice Center, U.S. Coast Guard, pilots’ associations, port authorities, or other maritime interests. Emphasis here is on conditions of concern to mariners with regard to safe passage of ships. Summary: What is a Tropical Cyclone? - Hurricane Hazards - Tropical Cyclone Graphical Products - Ways to Stay Informed - What To Listen For - Are You Ready - Family Emergency Plan. Sumario: ¿Qué es un Ciclón Tropical? - Peligros del Huracán - Productos Gráficos de Ciclones Tropicales - Maneras para Mantenerse Informado - A Qué Prestar Atención - ¿Está Usted Preparado? - Plan Familiar de Emergencia. 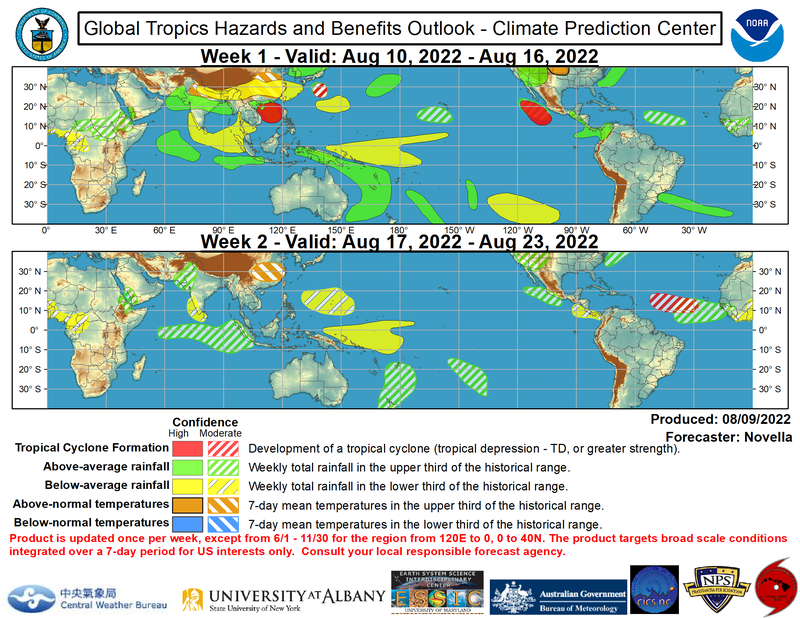 On Tuesday, the Climate Prediction Center (NWS/NCEP/CPC) produces a benefits/hazards assessment for the global tropics for the upcoming 1-2 week time period. The Global Tropics Hazards and Benefits Outlook is a forecast for areas with elevated odds for above- or below-median rainfall and regions where tropical cyclogenesis is favorable or unfavorable for the upcoming Week-1 and Week-2 time periods. The rainfall outlook is for precipitation integrated over a week and targets broad-scale patterns, not local conditions as they will be highly variable. Above and below median rainfall forecast areas are depicted in green and yellow respectively. National Hurricane Center Marine Product Descriptions: Text Products - Graphical Products - Other Tropical Analysis and Forecast Branch (TAFB) Services. Including: NHC Marine Radiofax Broadcast Schedule. I’m often asked the question “What do I do with my boat when there is a hurricane approaching?" I have gathered and consolidated information from numerous sources to help the boat owner in the analysis of his/her particular situation. Then the boat owner can determine the best method to prepare their boat for the eventual tropical cyclone encounter. The suggestions mentioned in this paper are intended to guide the mariner in developing an individual preparedness plan to help preserve life and protect their property. The Tropical Cyclone Formation Probability Product by NOAA/NESDIS/OSPO provides an estimate of the probability of tropical cyclone formation within the next 24 to 48 hours in 1 by 1 degree latitude/longitude areas from 45S to 45N and 0 to 360E. For guidance purposes only. List and map of active tropical storms with 48 hour tropical cyclone formation probalility map (NOAA/NESDIS/OSPO/SPSD). Hurricanes have been the cause of many maritime disasters and unfortunately, there is no single rule of thumb that can be used by mariners to ensure safe separation from a hurricane at sea. Instead, constant monitoring of hurricane potential & continual risk analysis when used with some fundamental guidelines become the basic tools to minimize a hurricane's impact to vessels at sea or in port. The Tropical Analysis and Forecast Branch (TAFB) is providing a graphical weather depiction that will highlight primary weather features of interest. A graphicast is produced for each basin. 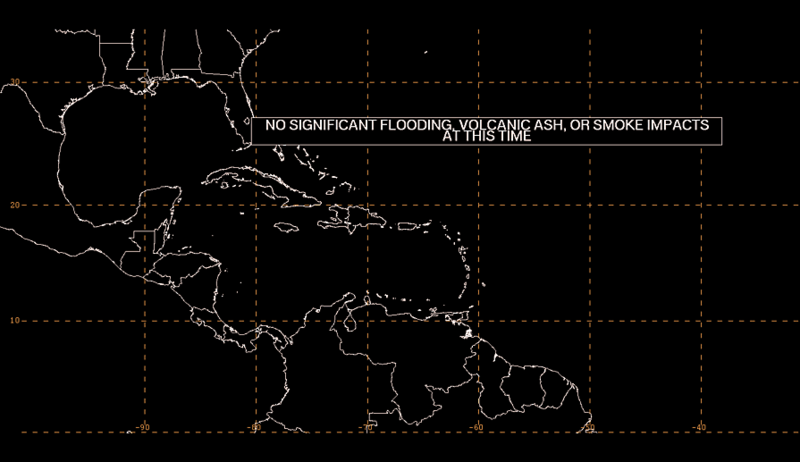 The graphicasts are intended to communicate to our users the most critical marine or other significant forecast issue(s) of the day (heavy precipitation/flooding, volcanic ash) in an effort to provide enhanced decision support services (DSS) to them. The image has planned updates once per day in the early afternoon. Between December 1 and May 14 (outside of hurricane season). The high wind and associated seas graphic is produced by the National Hurricane Center to depict areas of high winds and related seas over the Atlantic and East Pacific waters between December 1 and May 14 (outside of hurricane season). South of 30°N, areas are depicted for winds higher than 25 knots with the corresponding seas noted. North of 30°N, areas are depicted for winds of gale force (34 knots) or higher with the corresponding seas noted. Ranges in which the 25/34 knot thresholds are the upper limit (i.e. 25-35 knots) are included on the graphic. For more information. Graphics with current disturbances, five-day cyclones formation chance and tropical or sub-tropical cyclones. Graphics with current disturbances, two-day cyclones formation chance and tropical or sub-tropical cyclones. Between May 15 and November 30 (hurricane season). The tropical cyclone danger graphic is intended to depict the forecast track and corresponding area of avoidance for all active tropical cyclones and to depict areas for which tropical cyclone formation is possible within the next 36 hours over the Atlantic and East Pacific waters between May 15 and November 30 (hurricane season). The 3-day forecast track of each active tropical cyclone is depicted along with a shaded "danger" region, or area of avoidance. The danger area is determined by adding 100, 200, and 300 nautical miles to the tropical storm force radii (34 knots) at the 24-, 48-, and 72-hour forecast positions, respectively (hence the Mariner's 1-2-3 rule). For more information. This guide will hopefully aid the Mariner in understanding the complex structure and behavior of tropical cyclones in the North Atlantic Ocean. Once armed with this knowledge, and the information on where to acquire forecasts and guidance for current tropical cyclones, the mariner can be prepared to "weather the storm" or better yet, avoid these catastrophic events altogether. National Data Buoy Center (NDBC) provides hourly observations from a network of buoys and Coastal Marine Automated Network (C-MAN) stations. All stations measure wind speed, direction, and gust; barometric pressure; and air temperature. In addition, all buoy stations, and some C-MAN stations, measure sea surface temperature and wave height and period. Large numbers of boaters use the observations, in combination with forecasts, to make decisions on whether it is safe to venture out. When away from a computer/the Internet Dial-A-Buoy gives mariners an easy way to obtain weather reports. Also mobile access to the buoys. The importance of ship reports cannot be overstated: for every 100 observations on land, there is only about 1 observation at sea. Without your participation in the Voluntary Observing Ship (VOS) program, there would be vast marine areas without data, making weather forecasting nearly impossible for these areas. Reporting weather not only contributes to your safety, but adds to your basic knowledge of seamanship. Tide Predictions for USA, Pacific and Caribbean Islands. NOAA Tide Predictions allows users of the Tides and Currents website to generate tide predictions for up to 2 years in the past or future, at any of 3000+ locations around the United States. This website service provides both a graphical plot of the predictions as well as a tabular listing and printable pages. Also it is possible to choose a station using the Tides station map. At this time, NOAA Current Predictions is being presented as an alternative method to retrieve current predictions from the traditional Tidal Current Predictions. Initially, both prediction products will be available through the Tides and Currents website. After a period of time, the existing tidal current predictions will be removed from the Tides and Currents website and NOAA Current Predictions will become a fully operational product. Also it is possible to choose a station using the Currents station map. The Tides and Currents station map can be used to locate stations that provide water levels, meteorological observations, and current observations/predictions, as well as other products. Hovering the mouse over the site icon reveals the latest data listing, and clicking on the icon will bring up the data graphs below the map. Search criteria along the right margin allow the user to identify various data products, geographic regions, or data types from both active and historical sites. The Tides and Waters Levels Tutorial is an overview of the complex systems that govern the movement of tides and water levels. Also HTML version. The Currents Tutorial is an overview of the types of currents, what causes them, how they are measured, and how they affect people's lives. Also in HTML version. "Our Restless Tides" provides comprehensive information about the astronomical and physical forces that cause and affect the world's tides. Detailed diagrams and mathematical formulae illustrating the forces acting on the world's oceans are presented. "Understanding Tides" is a technical publication authored by Stacy Dopp Hicks, provides in-depth explanations of many aspects of tides, including Gravitational Attraction, Sun-Earth and Moon-Earth Systems, Spring and Neap Tides, Tide-Generating Forces, Tidal Waves in Gulfs and Estuaries, Tidal Bores, and Tidal Harmonic Constituents. Man in his never ending search for knowledge and in his travels on the sea has long known about the ocean's tides and currents. Although he may not have fully understood the reasons for the movements of these waters, he was very much aware of their benefits and dangers to him. The purpose of this book is to provide the reader with the knowledge required to carry out the most accurate tidal analysis and tidal prediction possible using any set of water level or current data that he or she may have available. The book is also intended to provide the reader with tools to interpret the analysis results with respect to the hydrodynamics (the physics of the water movement) of the bay or ocean from which the data were obtained, so that these results can best be used for particular oceanographic applications (NOAA Special Publication NOS CO-OPS 3). The "Glossary of Tide and Current Terminology" is and indispensable reference tool lists and defines more than 400 terms and concepts concerned with the tidal phenomena and its measurement. Also HTML version: Tides and Currents Glossary. Use this page to select ice analysis products for a desired area over a selected time span.These products are analyzed by sea and freshwater ice experts using multiple sources of near real time satellite data, derived satellite products, buoy data, weather, and analyst interpretation of current sea ice conditions. Areas: Chesapeake Bay (Norfolk, Newport News, Baltimore) - Delaware Bay (Wilmington, Philadelphia) - Potomac River (Washington). Use this page to select ice analysis products for a desired area over a selected time span. These products are analyzed by sea and freshwater ice experts using multiple sources of near real time satellite data, derived satellite products, buoy data, weather, and analyst interpretation of current sea ice conditions. Areas: Lake Superior - Lake Michigan - Lake Huron and Georgian Bay - Lake Erie and Lake St. Clair - Lake Ontario. Seasonal outlook is issued during the first week of June. North American Ice Service (NAIS) forecasts are generated during the months of July through December of each year, to cover Eastern and Western North America plus Hudson Bay. 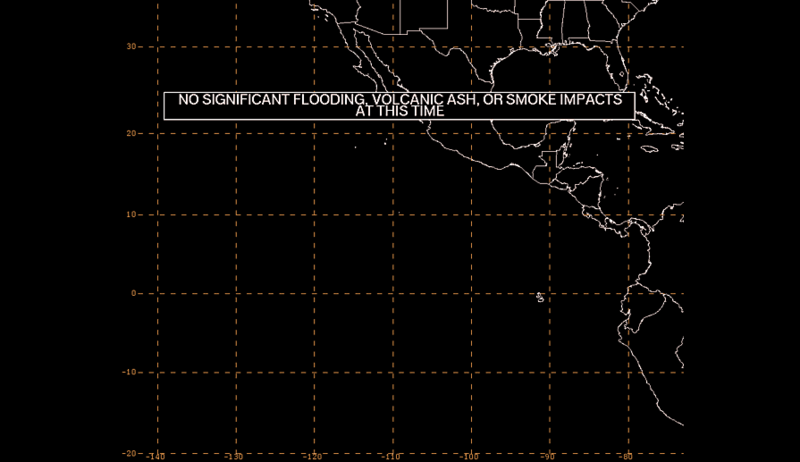 Forecasts are rendered either as graphical images or as text, possibly with graphics embedded. The date in the filename indicates the last day for which that forecast is valid. Areas: Hudson Bay, Davis Strait and Labrador Coast - Eastern and Northern Arctic - Western and Central Arctic. 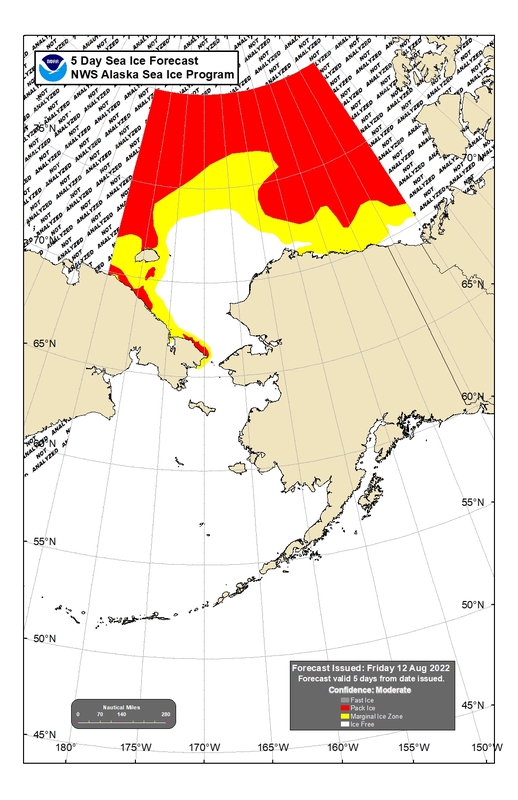 During the summer melt from the end of July to mid-October, USNIC provides a twice weekly analysis of sea ice conditions in the Northwest Passage and Northern Sea Route. These products are available on Monday and Thursday. Sea ice concentrations of 40% or more are hatched on the imagery, allowing users to see the locations of open pack, close ice, and compact ice pack which could influence navigability in these areas. The stage of development is derived from the USNIC's weekly hemispheric sea ice analysis product. The stage of development is analyzed by sea ice experts using multiple sources of near real time satellite data and is a weekly assessment of the current Arctic and Antarctic marine environment. The stage of development is determined by the analysts using the shape, tone, texture, fracture patterns, and surface topography of features depicted in satellite imagery, as well as the ice analyst's knowledge of the geographical area, weather patterns, current sea ice development, and daily monitoring of the areas. The stage of development page is updated every Thursday. The 30-day Sea Ice Change compares the sea ice extent over the past 30 days to the current sea ice extent for a particular day. 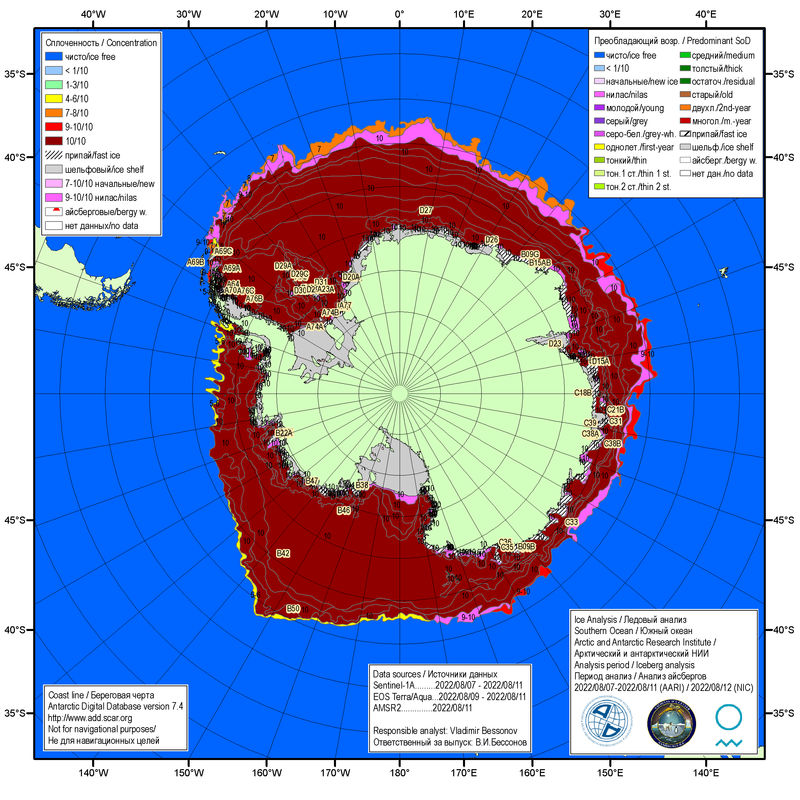 The product is created from the daily marginal sea ice analysis produced at the USNIC. The 30-day change graphic is available every Monday and the date for the comparison is listed in the legend. Antarctic ice charts from Norwegian Ice Service (NIS-NMI), U.S. National Ice Center (NIC), and Russian Arctic and Antarctic Research Institute (AARI). Charts for the Weddell Sea and Antarctic Peninsula are updated every Monday (Antarctic summer, October to April) whilst charts for the whole of Antarctica (concentration and stage of development) are updated on Thursdays throughout the year. 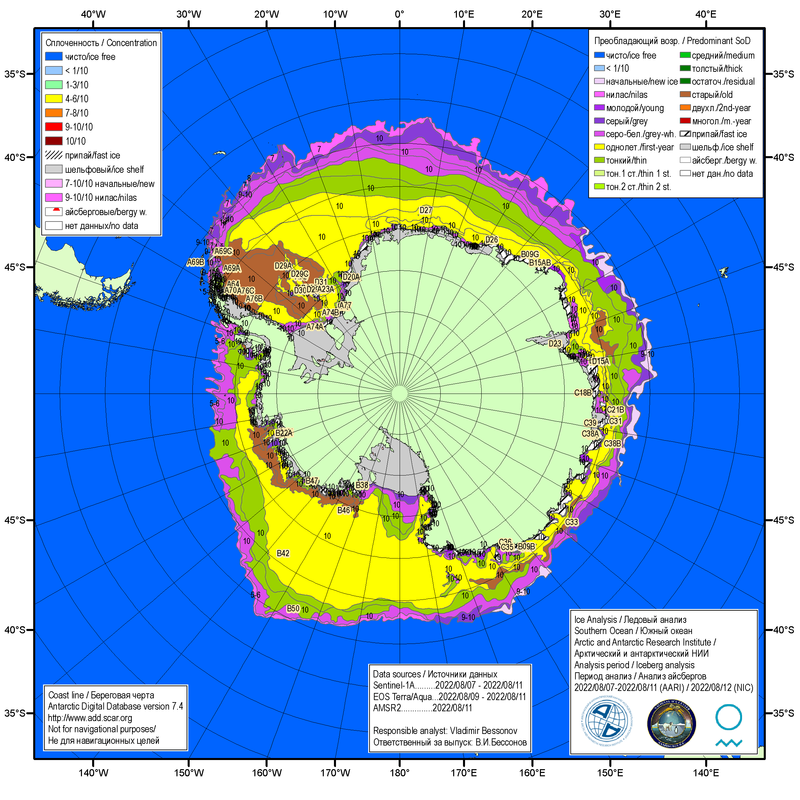 Detailed charts for: Antarctic Peninsula, Weddell Sea East, Bransfield Strait and Adelaide Island. The U.S. National Ice Center issues a yearly seasonal outlook indicating the expected recession pattern for the Ross Sea during the upcoming Austral summer. Ice edges are depicted at 15 day intervals between 15 December and 15 February; the term “ice edge” is used to delineate the boundary between areas with greater than or equal to 4/10ths sea ice and areas with less than 4/10ths sea ice. Specifically, this outlook is provided as environmental awareness in order to safely plan for an ice breaking vessel to break the McMurdo/Ross Sea channel. The U.S. National Ice Center (USNIC) track icebergs in the Southern Hemisphere utilizing the criteria of 10 nm on the longest axis and also include icebergs of twenty square nautical miles or greater. Names will be derived from the Antarctic quadrant in which they were originally sighted along with a sequential number. The waters surrounding this very large icebergs are assumed to contain traces of smaller bergy bits or growlers, as are often found in Antarctic waters. This is not intended to be a comprehensive list. Consult the Notice to Mariners for safety of navigation (More information). Significant wave height is shown in the charts, this is the average height of the highest one-third of waves. Maximum waves may be up to twice the significant height. Height in feet. The combined sea height (Hc) is defined as the square root of the sea-wave height squared plus the swell-wave height squared. The combined sea height represents an approximation of the height of the highest crests of water formed when the crests of sea waves interact with the crests of swell waves. On the map red arrows shown predominant wave direction, blue squares are observations with waves height and wind barbs are observations with wind speed & direction (also sea waves direction). Height in feet. 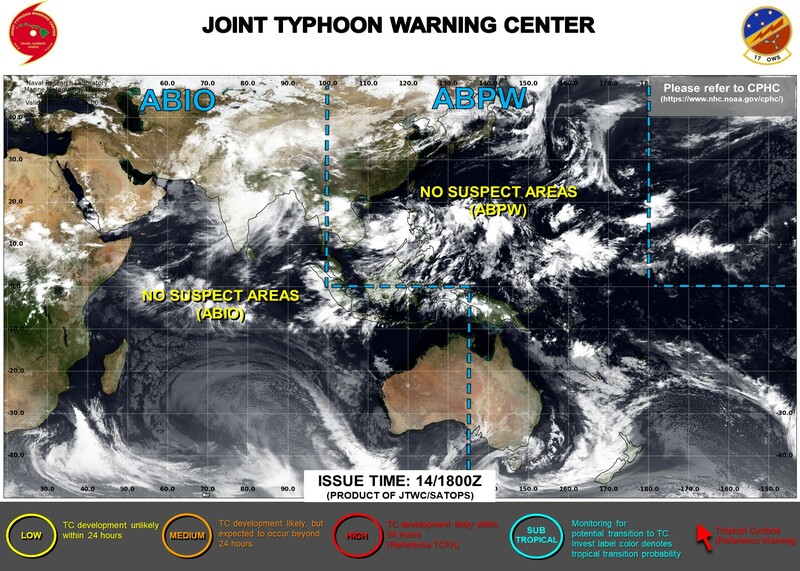 To understand the weather situation in the Western North Pacific and Japan. Table of contents: Geography - Oceanography - Climatology - Tropical Cyclones - Forecasting - Tropical Cyclone Tracks - Terminology. Tropical Cyclone Web Page Goals: 1) To minimize the threat of tropical cyclones to military and civilian interests world-wide that are affected by tropical cyclone activity - 2) To combine geostationary and polar orbiting satellite data together so that the Navy and the rest of the military community can have a centralized real-time source of data pertaining to tropical cyclones. The tropical cyclone forecasts shown here aren't yet operational and are presently in beta testing and operational demonstration. FNMOC is not responsible for their use in the forecasting of tropical cyclones. SSM/I products displayed here have not been verified against FNMOC WebPage products and may differ in color tables and units of measurement. Concerned customers should confirm these forecasts with official sources. USNO servers provide a wide variety of web-based time synchronization products including embedded web clocks to display UTC on other web pages. HMNAO produces a world time zone map for use in its publications. This map is available in PDF and PNG. Also available on HMNAO website. Computes almanac data for major solar system bodies and navigational stars for an assumed position and time. This page allows you to obtain all the astronomical information necessary to plot navigational lines of position from observations of the altitudes of celestial bodies. Simply fill in the form below and click on the "Get data" button at the end of the form. A table of data will be provided giving both almanac data and altitude corrections for each celestial body that is above the horizon at the place and time that you specify. Sea-level observations are assumed. The almanac data consist of Greenwich hour angle (GHA), declination (Dec), computed altitude (Hc), and computed azimuth (Zn). This chart displays constellations and the 57 navigational stars used in the Air and Nautical Almanacs. The navigational stars are distinguished by their proper names. The book provides the following data tabulated at 10-minute intervals to a precision of 1 arcminute: the Greenwich hour angle and declination of the Sun, Moon, and three navigational planets; the Greenwich hour angle of Aries; rise and set times of the Moon for a range of latitudes; and other data. Each edition also contains sky diagrams for each month; sunrise, sunset, and twilight tables; and positions of the navigational stars. This Handbook provides guidance for assessing a hurricane threat's circumstances and likely impact on the given port to support decision-makers' reasonable choice between either remaining in port or evading at sea. This choice is based on informed compromise between a harbor's protective qualities, and the possibility that a sortie will prove to have been unnecessary (HTML). Severe tropical cyclones, also known as typhoons or hurricanes, are among the most destructive weather phenomena a ship may encounter whether the ship be in port or at sea. When faced with an approaching tropical cyclone, a timely decision regarding the necessity and method of evasion must be reached. Basically, the question is: Should the ship remain in port, evade at sea, or if at sea, should it seek the shelter offered by the harbor? This Handbook examines a number of western Pacific and Indian ocean ports and evaluates their potential as typhoon havens. This information should provide useful guidance to commanding officers in answering the above questions (HTML). These handbooks are intended as guidance for ship captains whose vessels are threatened by actual or forecast strong winds, high seas, restricted visibility or thunderstorms in the listed port areas. These regions are renowned for numerous areas where "Local Effects" on winds, seas, and visibility can cause dangerous operating conditions. Prior knowledge of these local characteristics and the resultant effects encountered can be extremely useful in the decision making process. Causes and effects of such hazardous conditions are discussed and precautionary or evasive actions are suggested for various vessel situations (HTML). An extensive collection of current and archived satellite imagery, satellite data products, and other displays, providing global coverage for tropical cyclone monitoring and analysis. The tropical cyclone forecasts displayed here are the latest forecasts received at NRL, and may or may not be the most current forecasts available from the operational centers. NRL collects these forecasts for ATCF project development, and is not responsible for their use in the forecasting of tropical cyclones. Concerned customers should confirm these forecasts with official sources. With continuing ice-melt and more open water present, increased commercial and military traffic will become evident, but not without cost. Surface Fleet and Aircraft Carrier Operations in the Arctic Ocean is a new challenge for the Arctic Forecaster. Snow, ice, freezing rain, wind, wind chill, floating ice and icebergs, to name a few, can take a toll quickly, rendering the fleet, equipment, communications and crew operations extremely difficult. The prudent Arctic forecaster will consider all products from climatology, satellite imagery through numerical products. The forecaster will need to more frequently update environmental information, build a good forecast and environmental recommendation to the fleet commanders in order to ensure the fleet is kept out of "harms-way" and remains an effective force. Use of this handbook will assist the Arctic Forecaster in that endeavor (HTML files, 2015). The following materials are provided as an introduction to Arctic region climate, weather, and other environmental conditions. A basic objective is to provide materials that will assist users in developing a workable understanding and appreciation of the unique polar conditions including extreme cold, month long daylight and dark periods, and ice covered waters. Terminology and products specific to regional environmental factors will be addressed and used throughout the materials. Tables, graphs and glossaries addressing Arctic environmental conditions are provided as introductory and reference materials (HTML files, 2014). The Admiralty and Maritime Law Guide includes over 1,500 annotated links to admiralty law resources on the Internet and a growing database of admiralty case digests, opinions and international maritime conventions. The emphasis is on the law of the United States and the focus is on Internet resources that can be used in an effective and practical manner by admiralty attorneys and maritime professionals. Esta publicación contiene la información referida a las cartas y publicaciones náuticas editadas por el Servicio de Oceanografía, Hidrografía y Meteorología de la Armada (SOHMA), de la República Oriental del Uruguay. Cartas, cartas náuticas electrónicas, publicaciones, hojas y laminas publicadas por el SOHMA (HTML). La Lista de Faros y Señales Marítimas (Océano Atlántico Sur, Río de la Plata y Río Uruguay), describe las señales marítimas instaladas en tierra y flotantes. Los Faros Aeronáuticos y luces de atención aérea son incluídas cuando son visibles desde el mar y puedan representar una ayuda a la navegación. En ella se ha insertado un capítulo que incluye los Radio Faros de la Región como también se incluye un “Glosario de términos en español, inglés y portugués”. Lista para la zona del Océano Atlántico (Costa Brasileña y Uruguaya desde Río Grande a Punta del Este, Costa Argentina desde Cabo San Antonio a Necochea, y Atlántico Sur-Islas Shetland/Isla Rey Jorge), Río de la Plata y Río Uruguay. El Servicio de Oceanografía, Hidrografía y Meteorología de la Armada (SOHMA), acorde a sus cometidos publica desde el año 1976 la predicción de mareas de algunos puertos de la República Oriental del Uruguay y de la República Argentina, en "Almanaque" y luego en "Tablas de Marea". Desde 1991 se comenzaron a incluir las predicciones horarias de alturas de marea para la Base Científica Antártica ARTIGAS (Isla Rey Jorge, Islas Shetland del Sur), producto de investigaciones que se vienen realizando desde el año 1987. Se busca en esta edición INTERNET dar una nueva herramienta práctica y útil para el hombre de mar y todos aquellos que puedan necesitar este tipo de información. Publicación que informa para cada día, las horas calculadas de salidas y puestas de sol y luna, e inicio y fin de los crepúsculos. Informa además el inicio de las fases lunares, de las posiciones notables de la tierra (estaciones - festividades) y los eclipses. La presente publicación ilustra los principios generales y las reglas aplicables del Sistema de Señalización Marítimo Internacional (tanto para la Región “ A” como la “ B”) y Otras Ayudas a la Navegacion. Contiene al propio reglamento con la finalidad de apoyar la seguridad en la navegación. Publicación de bolsillo para tener una rápida referencia visual de los diferentes tipos de nubes y estados del mar, facilitando su identificación. Brindan al navegante toda información de utilidad relacionada con las modificaiones en las Ayudas a la Navegación, los peligros para la navegación, nuevos sondajes de importancia y de una manera más general, toda información que afecta a las Cartas y Publicaciones Náuticas.